The freight transportation industry is responsible for almost 12% of the U.S. GDP, employing millions of people across the country. The latest Freight Facts and Figures (2013) report from the Bureau of Transportation Statistics reports that by 2040, long-haul freight could increase to over 450 million miles per day. At the same time, a chronic labor shortage will become an acute problem as fewer truck drivers join a labor force where an average driver is 55 years old. In case you never find time to dig through government reports, today's post will highlight a few facts and figures shaping the future of transportation in the U.S (link to the report provided as well). 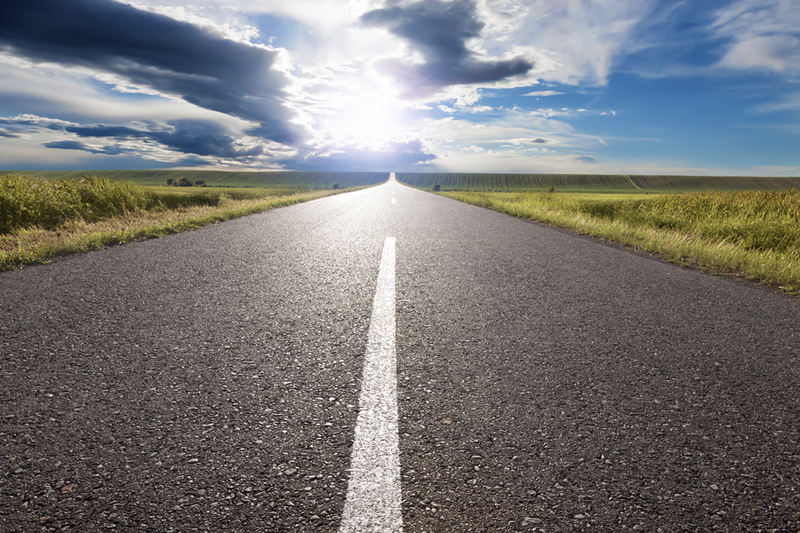 The latest Freight Facts and Figures report estimates that by 2040, long-haul freight in the U.S. will increase dramatically to over 450 million miles per day. 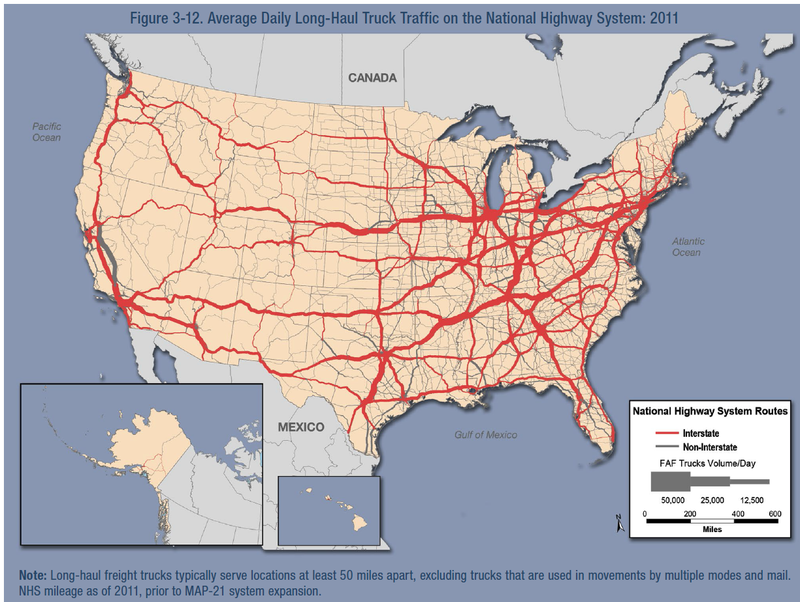 U.S. long-haul trucking is concentrated on major routes of the Interstate System connecting population centers as shown in this 2011 estimate of average daily truck traffic. 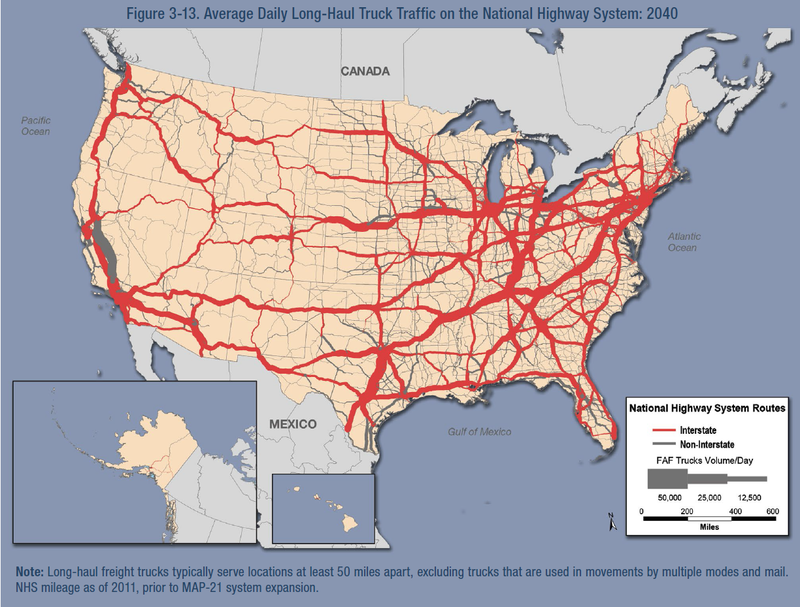 The tremendous increase in truck traffic will flood an already loaded national highway system where at least every fourth vehicle is a truck on more than 14,000 miles of roadway where traffic will increase 175%. Without changes in network capacity, estimates indicate that areas of recurring peak-period congestion will rise to 34% of the national network from 10% in 2011. The transportation industry has made impressive gains in productivity as measured by output per hour worked over the last 10 years. 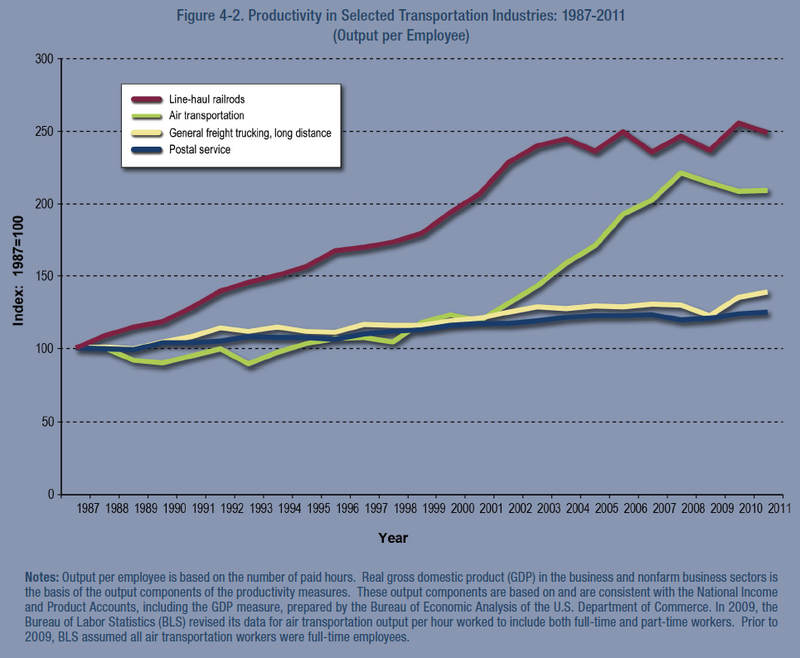 During the period 1987-2011, freight trucking productivity grew 39% while line-haul railroading more than doubled. Looking ahead, however, it appears that productivity improvements are leveling out as a serious worker shortage continues. Across the country thousands of trucking jobs go unfilled according to the American Trucking Association (ATA). The Bureau of Labor Statistics recently estimated that the average age of a truck driver is 55, and a survey performed by the National Institute for Occupational Health and Safety reported that truck drivers are twice as likely to be obese as the rest of the U.S. population and 88% of drivers surveyed reported at least one risk factor for chronic disease (e.g. smoking, high blood pressure, etc...). While trucking accounted for more than 30% of total warehouse and transportation employment, the small employment gains have not kept up with demand. The expanding demand expected in the upcoming years combined with the supply constraints in the form of driver shortages will continue to cause challenges for shippers. Price increases, dynamic pricing, density-based pricing, and other complications will continue to make it more difficult for shippers to accurately predict and manage the cost of freight. Good relationships with carriers and good integrated systems will certainly help, but it's our bet that the most successful shippers will work to adapt frequently as the business of shipping continues to change rapidly. The Bureau of Transportation Statistics in U.S. Department of Transportation has a very detailed resource with many of the statistics and charts reviewed and analyzed in this posting and much, much more. 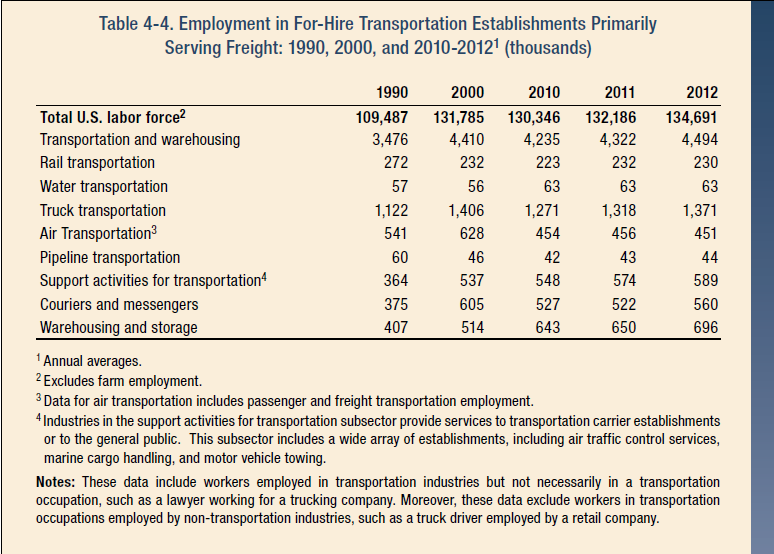 For more information, visit their site at http://www.rita.dot.gov/bts/node/493771 or get a copy of the latest report here Freight Facts and Figures 2013. The Pacejet cloud-based shipping software and carrier network helps business shippers reduce costs and improve service. Contact us today at 877-722-3538 or via pacejet.com or info@pacejet.com to learn more.